Get Your FREE Copy of 1200 Studies Right Here! Get this FREE 550 page interactive eBook containing excerpts from over 1,200 published PubMed studies, containing thousands of references. The science contradicts what we are being told by many medical doctors, the media, our government officials and the pharmaceutical industry about the safety and effectiveness of vaccines. We are told time and time again, that vaccines are extremely safe and effective and the the “the science is settled” on the matter. Well I have news for those who think so. There are thousands of scientists and researchers that disagree. And, you are about to meet them and hear what they have to say. The bottom line is that THE SCIENCE IS FAR FROM SETTLED! I have spent nearly 2 years compiling this exposé, with the goal of sharing it with the world. Please read the introduction below describing the looming crisis we face, and the reason I have undertaken this massive fact finding effort. You can download the FREE eBook either here at the top of the page, or at the bottom. Before you download it, I would love for you to scroll down and read about the dire circumstances we face and the reasons I created this project. That’s also where you will learn how you can get the most out of the 1200 Studies eBook in the least amount of time. This is the most extensive and well documented exposé ever, about one of the most controversial yet important topics of our time. The amount of studies and research on this subject is overwhelming, but I have done all the work for you and found a way to present it, so it will be easy for you to quickly and easily navigate to exactly what you want to read. It’s like getting the cliff notes for a textbook and being given the “hotlinks” that will take you directly to the sections that interest you, and to the studies that are being quoted from. That way it will be easy for you to verify if what you are being told is true! You are about to have FREE direct access to hundreds of studies and indirect access to thousands of studies through the references in those studies. 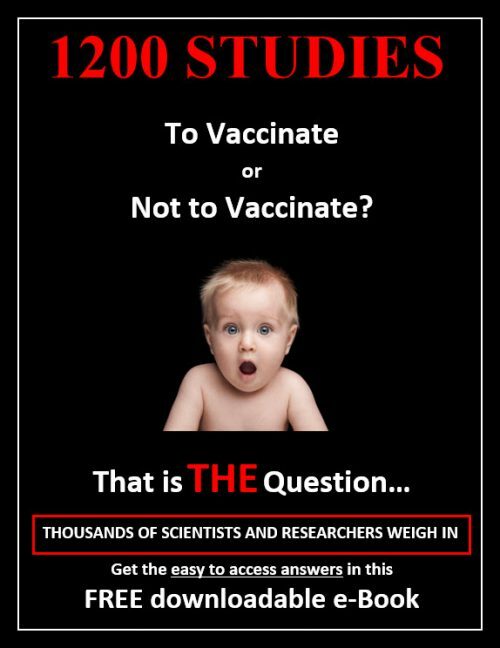 As you will see these studies differ, and in many cases widely differ from what we are currently being told about the safety and effectiveness of vaccines. When the 2018 statistics come out in less than 2 years, it is expected that the rate of autism may be as high as 1 in 25 children, with approximately 4 times as many boys than girls being affected. That means that approximately 1 in 5 boys will be on the autism spectrum!! Many experts believe at the current trajectory, somewhere between the years 2025 and 2032, 1 in 2 boys will be autistic!! In addition, consider the crippling rates of other intellectual disabilities just mentioned. This is COMPLETELY UNACCEPTABLE! And collectively, we have to do something to change that. What would this mean for our society? For one thing, this will be an economic disaster. Even at the conservative projected costs of caring just for autistic individuals, these costs will cripple our economy. (outlined on page 2 of the eBook) – In addition to the crippling cost economically, can you imagine the impact on us socially, on militarily readiness and on the affected children and families themselves? What about our intellectual capacity to churn out scientists, inventors and business innovators for the years to come? The clock is ticking. Left unchecked, it is truly a doom and gloom scenario. We must get to the bottom of it and we must do it now! And by sharing this document, you can be a part of the driving force to make this happen. The vaccine debate is fraught with emotion, misinformation, bias and conjecture. But now for the first time, you have access to an enormous amount of credible scientific information (which you won’t have to be a scientist or doctor to understand). It is all organized in such a way to allow you several ways to view the contents, depending on your level of interest and the amount of time you have to read. Even just reading the Table of Contents, will summarize the main take-aways of each section and topic. This alone, will give you insights into the contents and I believe will tantalize your curiosity to know more. From the most hard-core scientific mind to the lay person, this expose will shine light on THE TRUTH about this very controversial topic in a way that persons from all levels of understanding will be able to grasp. This is an interactive document. The format this document is being presented in, maximizes your ability to search by key word or phrase and jump from Table of Contents directly to items that you want to see with a mouse click. And, it will allow you to access the actual research, the studies and the articles instantly. That way you can immediately check to see if what my document says is true. Books can be tedious to wade through and checking references difficult and time consuming. This e-book changes all of that! It makes it all HYPER-FAST AND EASY in just a click of your mouse. This has been an arduous task to compile all of this information and organize it for ease of use. Even though it has been all consuming for me over nearly the past two years, it has been a labor of love. After reading this, I believe that you will have a true appreciation for the massive effort involved in assembling this amount of information AND making it so user friendly. I truly have a passion and a love for helping people. That passion is magnified when it comes to the health and well-being of children. When I see families affected by these developmental conditions including autism, and the devastating personal, relational, occupational, marital and economic challenges they face, it saddens and frustrates me. Many had a healthy, happy, fully developing and functioning child one day, and then lost that child into a shell of their previous selves the next. The rest of their lives have been forever changed, often in an instant. While both sides in this issue fight it out, the affected children and the families are innocent bystanders and are being either ignored or used as pawns to advance an agenda. This is wrong! And, no matter where on the spectrum of opinion you stand with this issue, the health and lives of millions of current and future children and families are hanging in the balance. And this is not just an issue in the USA. It is a world-wide issue. I challenge those with all viewpoints on this topic to read this eBook with an open mind, then decide how you feel afterwards. I wanted to remove any objections to getting this, so I made it free and am not requiring you to give me your email address or contact information. You can choose to opt in for future updates if you would like, but that is completely up to your discretion. If you want to donate to this effort, your contribution would be greatly appreciated. Both links are near the bottom of this page. If you are so inspired to share this information (and I believe that you will), please take some time to do it. There is a dire need for this conversation to be advanced and the time it must start is NOW. The only way to move the ball on this topic, is to share this information and knowledge as widely as possible. Therefore, it is critical to share this with everyone that you know. You can click on your different social media links on this page and immediately share this link to all of your friends and contacts. You can share it with all of your contacts, by using email share link (next to the social media links) or copy the link in the navigation window at the top and paste it into an email. Please share this with your elected state and federal representatives (easy instructions and links to find their contact information are found near the end of the book). Share this with all of the medical doctors and other physicians you know. They need to know the truth and that this science and evidence based information exists. You have my permission to host a download link of this eBook on your website and share it with your visitors if you have the capability to do so. There are only two things I ask. Do not change or alter anything and do not charge anything for it. Once the PDF opens, you can read it from there on your computer or download and save it to your computer. To do that, in the upper right corner of the open PDF document, you will see a downward facing arrow. This is the download button. Click on that symbol and a download window will open. You can choose to open it on your computer or save it to your downloads folder. Make your selection and click OK. Thank you in advance for helping to get this vital information out. This project has been a monumental task. But it needed to be done! If you appreciate the time and effort that it has taken, if it will benefit you or someone you know in any way, please consider donating to this cause. Even what you would normally pay for a book would be appreciated. To donate to the efforts and costs of the production of this document, please click on this donate now link. Thank you for your support. Sign up for updates on 1200 Studies eBook!